We are delighted to highlight some excellent research recently published in a range of Royal Society of Chemistry journals covering exciting developments in the area of quantum effects in complex systems. You can get involved in discussing the latest developments in this exciting area with speakers including Helen Fielding (UCL), Greg Scholes (Princeton University), Sharon Hammes-Schiffer (Yale University), David Manolopoulos (University of Oxford) and many more. 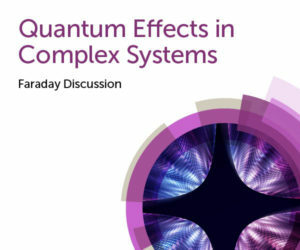 Submit your abstract for Quantum effects in complex system: Faraday Discussion. This event in Coventry, UK on 11–13 September 2019 will address the challenge of understanding nuclear quantum effects in complex, many-particle systems, and the insights this can provide into photosynthesis, proton and electron transport in materials, tunnelling in enzyme-catalysed reactions etc. Submit your abstract by 19 December and get involved! Click here to read even more excellent research! We are delighted to share the articles and discussions on Artificial water channels published in our latest volume of Faraday Discussions . Click here to find more related research papers! 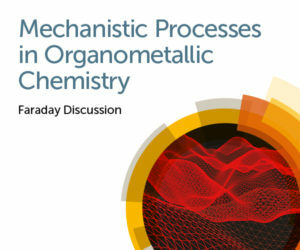 We are looking forward to our Faraday Discussions meeting on Mechanistic processes in organometallic chemistry in York, UK from 2–4 September 2019. We’ll be discussing current understanding of unusual element-element bond formation and activation, physical methods & computational approaches for mechanistic understanding, plus mechanistic insight into organic and industrial transformations. The oral abstract deadline is approaching! Submit your abstract by 17 October for the opportunity to discuss your work with an excellent line-up of speakers including Odile Eisenstein, Thomas Braun, Jeremy Harvey, Aiwen Lei, Guy Lloyd-Jones, Jennifer Love and more. To get you in the mood, we encourage you to read some of the excellent related reviews and original research recently published in a range of Royal Society of Chemistry journals. Several are free to access – enjoy! With something to appeal to researchers working on both isolated and confined molecular systems, we’ll be discussing some fundamental physical chemistry. Nonetheless the impacts are tangible in atmospheric chemistry, biology, physics, and astrophysics and astrochemistry. Don’t forget that every delegate has the opportunity to participate, with a record of the comments and discussions in the associated volume of Faraday Discussions. 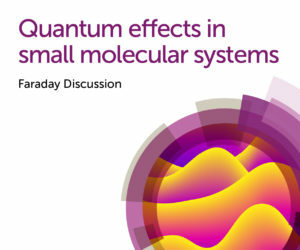 With the rapid rate of development and broad application domains, the principal aim of this Faraday Discussion is to provide a snapshot of the current theoretical and experimental state-of-the-art in methods designed to interrogate and rationalize the role of quantum-mechanical effects in complex systems; simultaneously, this meeting will act as a new forum to discuss ideas which span the experimental/theoretical domains. Submit an oral/paper abstract by 19 December 2018 if you wish to be considered for an oral presentation and associated published paper (submission opening soon). For more information about the unique format of Faraday Discussions check out our FAQs page. Faraday Discussions is pleased to sponsor the upcoming Symposium in memory of Ahmed Zewail: Ultrafast molecular sciences by femtosecond photons and electrons which will take place at the ACS Division Of Physical Chemistry 256th National Meeting in Boston, MA from 19-23 August 2018. This special symposium in memory of the late Ahmed Zewail includes 44 invited and 4 contributed talks on the most recent advances in Femtoscience, including theory and experiments. Topics include reaction dynamics in gas, liquid, and at interfaces, charge transfer processes, primary processes in biology, and electron dynamics with ultrafast diffraction and imaging. These studies are now possible, thanks to developments in mid-IR, Vis, UV, X-Ray, and electron pulses with durations on the femtosecond and attosecond timescales, many of which were pioneered by Ahmed Zewail. 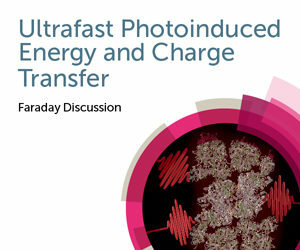 The topic is closely related to the Faraday Discussion in Ventura, California in April 2019 on Ultrafast Photoinduced Energy and Charge Transfer, co-Chaired by Mike Ashfold (University of Bristol) and Steve Bradforth (University of Southern California). 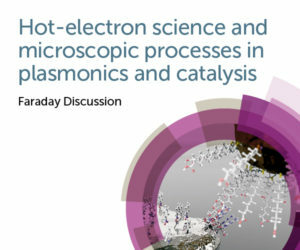 We are delighted to share this collection of the most read articles from last year’s diverse range of Faraday Discussions. From fundamental studies to applied research, these articles showcase the breadth of topics being discussed by world renowned researchers, with many available Open Access. We’ve extended the deadline to 27 August to give more people a chance to contribute – don’t miss out! It’s tricky to analyse mixtures that don’t easily separate into their constituent parts. But it’s important to do so to look at pollutants in soil, the components of food or biological metabolites. So we’re bringing together experts from across a range of specialities to discuss this fascinating field. 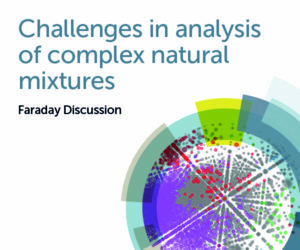 From chromatographers to spectroscopists and those whose focus is on a particular biological metabolite or environmental mixture, researchers from around the world will be in Edinburgh next May to discuss Challenges in analysis of complex natural mixtures. 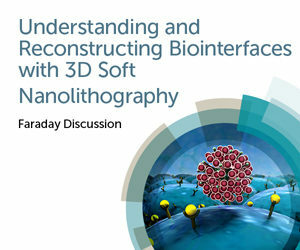 Topics for discussion include the latest mass spectrometry and chromatography techniques, high-resolution techniques, data mining and visualisation, and chemometrics.